Toddler, estimated to be about 2, evidently wandered off during daycare trip to park; she has been safely returned to her parents. 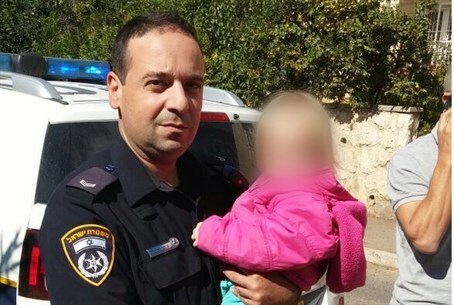 The Moked 100 police hotline in Jerusalem received a report Tuesday morning that a toddler, estimated to be about two years old, was spotted wandering around the Beit Hakerem neighborhood, alone. Officers from the Moriah unit took the girl into custody and embarked on the difficult task of returning her to her parents. The police checked a nearby kindergarten to see if any children were missing, but teachers and daycare assistants there said everyone was present. The unit then announced that a child had been found and searched the area for distressed parents or other adults who had been with the child. They eventually located a man looking for the little girl. Upon questioning, the man revealed that the toddler had been out with a daycare center at a public park, in the supervision of an aide and an early childhood teacher. The group left the park to discover that the little girl had gone missing. Police turned the girl over to the daycare center and notified the girls' parents that she had been found. In the meantime, an investigation has been launched by the Moriah unit into the incident.